Certainly, these houses include way deeper meanings, spiritual ones and so on. The simplifications in this case are used only to investigate one particular side of life. Look at the important notes down below. The 2nd house's ruler is the mark of the person's tendency to wealth, according to many astrologers. E.g. : the cusp sign of the 2nd house is Aries - the Mars rules Aries. So the Mars rules 2nd house in this case. The next step is to look where Mars is situated in the chart and check its aspects. Mars could be placed in Taurus in the 2nd house, in conjunction with the Moon, trine Uranus and Pluto, square Jupiter, and in opposition to Neptune. Yes, it sounds complicated, but it is the picture that will tell us the money potential of the chart-owner. Our sample case has lots of planets in one house. We have the Mars and the Moon, and what's more it has the Sun and the Mercury. The Venus is also there: technically it is in the 1st house but in conjunction with the 2nd house cusp. As you can see, the dynamic here is crazy. We can expect the owner of the chart to be pretty ambitious about wealth. 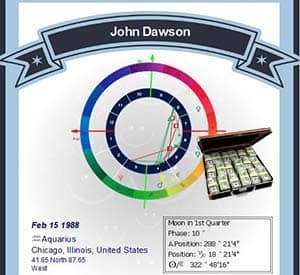 This person is making good money, but let's pay attention to the square of the Mars to Jupiter and opposition to Neptune which leads us to the conclusion that the individual can't save it and only spends. This individual is as concentrated on earning, as he or she is on spending and pampering him\herself as the square to Jupiter notes. The opposition to Neptune evidences the inability to save money, because money tends to disappear soon after appearing. However, the main point here that in reality a person is quite satisfied with the way things are going. The principles of life of this individual are oriented on the pleasure the money bring, the pleasure in spending and getting the desired things. The person is satisfied with the fact that he or she gets an essential amount of money to support such lifestyle continuously. We believe that hard aspects to Neptune regarding money are quite complicated, and so are with Jupiter. There was an instant with one woman who came to an astrologer to analyze her chart. The chart indicated that this woman wasn't that ambitious about money, because her 2nd house was in conjunction to Jupiter. However, in real life she always tried hard to earn money, to afford more comfort. She was always exhausted, because she didn't really want a lot of money. She wanted a comfort which didn't cost much that time. As a result, all the money she had had, were wasted by her husband. 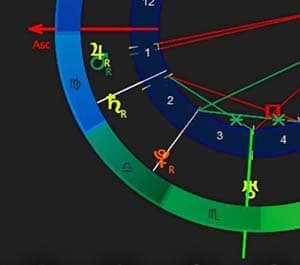 Neptune square to the 2nd house ruler that is conjunct Jupiter and it creates that square from the 8th house: the one of joined finances and money from connections/marriage. The location and state of Mars and Saturn show us the real ambitiousness and determination of the chart owner. These characteristics are vital when the wealth is gained by the hard work of the individual. The experience shows that no matter hard or soft, the aspect between Mars and Saturn provides proper motivation to success, when the aspect is hard the motivation is felt intensely. Needless to say that if the person has only easy aspects in chart including some money indicators, the desire to earn and save money may not be strong enough or the motivation is inconsistent. There is a case of a woman who reached everything with hard work and her career ladder included the lowest positions and led to the highest. She had a yod configuration, having Venus, Saturn and Jupiter. The sextile part of the yod is Venus sextile Saturn, and Jupiter quincunx both Venus and Saturn. Mars is trine to Jupiter and square to the Saturn. It is important that Saturn creates complicated aspects to Mars and to Jupiter, making a trine. This type is called a 'mixed' configuration. You can find here lots of favorable and unfavorable aspects. However, mixed configuration is the thing to check if you are looking for indicators of financial success made only by the efforts of this person (so inheritance and presents are not included). Only easy aspects, unfortunately, cannot predispose person enough to desire to make money and reach for greater goals. So this woman believes that the key to her success was her readiness to face any challenge, she has never refused from her goal no matter what difficulties she encountered. Possibly that such determination and purposefulness are the result of Sun and Mercury trine Neptune, because she has well-developed intuition and often relies on it. As a woman of her time, she needed to have some belief (Neptune) and strong inner feeling to reach the level of success that she has now.